With his future hinging on a legal challenge to Malaysia’s Sedition Act, cartoonist Zunar is currently in the United States to accept an International Press Freedom Award from the Committee to Protect Journalists tonight. Last week he and the other CPJ honorees also had the chance to speak before the human rights caucuses from both houses of Congress, and Washington Post comics writer Michael Cavna caught up with him for a brief interview. Zunar is the first full-time cartoonist to receive the award founded by CPJ in 1996. He is joined by an impressive list of courageous fellow journalists, including collectives of citizen reporters from Ethiopia and the ISIS-controlled region of Syria. Having faced harassment and censorship from the administration of Malaysian Prime Minister Najib Razak for years, Zunar now faces nine separate counts of sedition for nine tweets he sent in February criticizing the politically motivated sentencing of opposition leader Anwar Ibrahim to five years in prison. If convicted on all nine counts, Zunar himself could receive up to 43 years in prison. Given [the] odds against beating the house, I ask him whether he’s considered becoming a fugitive and, as some cartoonists have done, be tried in absentia. No, he replies immediately, he wants to be there to back up his political convictions, even if he receives a conviction for his politics. The pressure [is now on] the government, and I know I get good support from the international community, the United Nations… so the world is watching my trial. So that is why I want to go back. I want to expose this for my country, not for me alone, and the government will get an official trial. This is my responsibility. 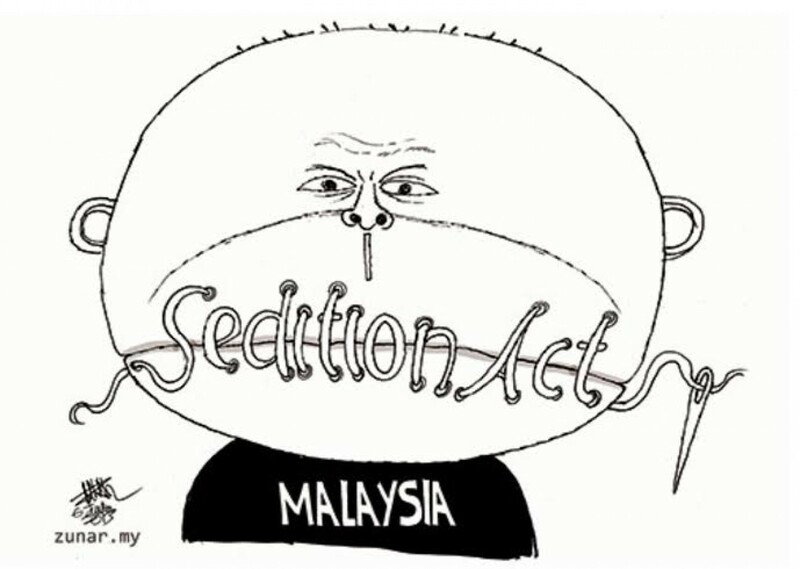 The next step in Zunar’s trial is scheduled for December 15, when a court will determine whether his challenge to the Sedition Act can proceed. In the meantime, please take a moment to sign the International Federation of Journalists’ petition calling on the government to drop the charges against him. Cartoonists Rights Network International also provides a convenient form letter to send to Malaysian embassies.